Tiger Woods tells media he spoke to Patrick Reed "for a long period of time" about his Ryder Cup controversy. 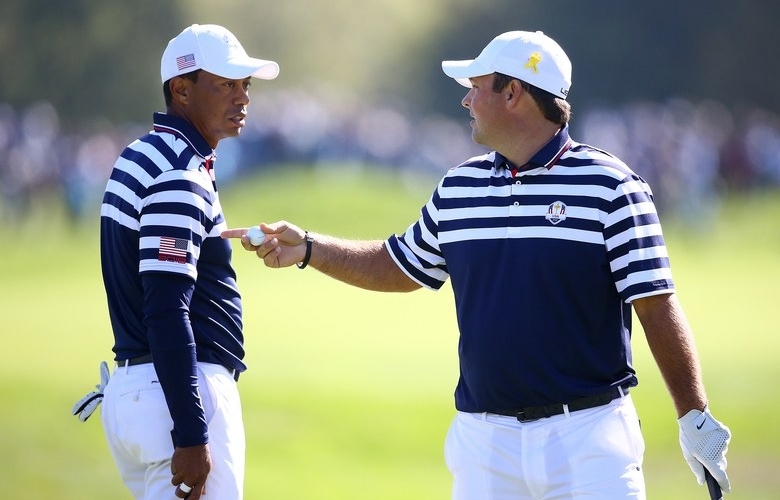 Tiger Woods has revealed he had a lengthy chat with Patrick Reed following his controversial comments surrounding the United States Ryder Cup team at Le Golf National in September. Reed went 1-2 in Paris, losing both his fourballs matches alongside Woods, but he did maintain his unbeaten 3-0 record in the Ryder Cup singles with a 3&2 victory over Tyrrell Hatton where his celebration p***** off Butch Harmon! However, Reed could do little to prevent Europe's seven-point demolition job on the United States. The Masters champion quickly came under fire by just about everyone in the US Ryder Cup side that week, including Woods, for his strong accusations of team-mate Jordan Spieth and even captain Jim Furyk. Woods addressed the media on Thursday afternoon after posting a 1-over 73 at his own Hero World Challenge tournament, where Reed shares the first-round lead alongside Patrick Cantlay after a 7-under 65. "Yeah, we spoke for a long period of time but it will stay between us," Woods explained of clearing the air with Reed following his controversial Ryder Cup comments. NEXT PAGE: TIGER WOODS REVEALS NEW INJURY CONCERN!